One name missing from the latest wave of social networking is Microsoft, which may be why it’s pushing its new Spindex service onto the world. Instead of being a social net by itself, it aggregates your online life for you, making it much easier to program. Spindex springs from Microsoft‘s FUSE research labs, and it was just announced yesterday at the Web 2.0 Expo event in San Francisco. A Microsoft spokesperson explaining the system to us described it as “a new exploration designed to deliver new social, real-time and media rich experiences for home and work.” We hired a PR translator who confirmed Spindex aims to simplify what is becoming (for some) an increasingly onerous task of keeping up with all your different online social interactions, from lifecasting via Twitter, to uploading pics and casual gaming via Facebook, to using social net logins to comment on Web sites and blogs. 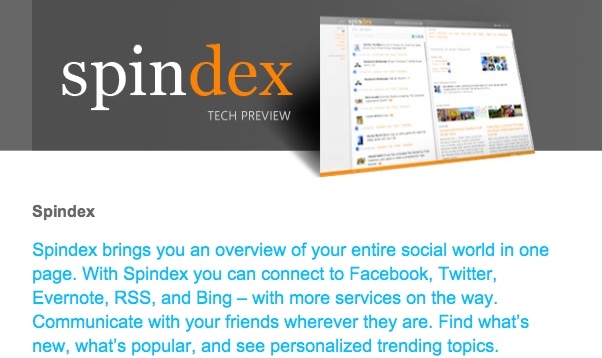 Spindex grabs your feed data and organizes it on a personalized page. It also ties into Bing, which auto-suggests topics so that you can onward-click to find out more on the interesting stuff “spinning around you” in your feeds (or link to Urban Dictionary to look up the meaning of “hip” phrases like Cosby Sweater, that your hipster pals are dotting their social feeds with). It also delivers to you neatly digested trends from across the social Web, so that you can keep your finger on the pulse of what the world (or the social-net-addicted part of it, anyway) is nattering on about. Think of it as similar to Threadsy, just a bit cleverer and with a more interactive bent versus Threadsy’s Gmail/social feed mashup. Two reservations: One, it’s being enthusiastically promoted by FUSE labs’ Lili Cheng. FUSE labs itself sounds smart–a hotpot technology incubator inside MS designed to produce novel new social tech that may one day power monetizable MS products but which generally pursues off-the-wall notions to see where they lead. But Lili, who I’m sure is an excellent researcher and actually heads up FUSE, brings a worrisome provenance with her. From her MS biography: “Lili was director of user experience for Microsoft Windows, where from 2004 to 2006 she oversaw design, user research, user assistance, and advanced development for Windows Vista.” Windows Vista, folks, Microsoft’s craptastically failed OS, a system so awkward that it was actually user hostile, rather than friendly. This makes me worry about Spindex’s long-term survivability and user friendliness. I’ll have to wait and see when Spindex pops out of its closed beta test before deciding, though. Everybody occasionally whiffs. Two, the concept of Spindex as a whole has me unsure. As an online writer I surely fall into the higher brackets of social web use, both in transmit and receive mode, and I have no issues controlling and monitoring each of the different social media streams I use individually. In fact, I get a warm sense of control from this–I get to decide what’s going on, what I transmit, and what I see as input rather than relying on some central system to decide for me. Douglas Adams fans may spot something of the failed electric monk about Spindex (Monks are the religious equivalent of dishwashing machines, designed to aggregate and believe “things for you, thus saving you what was becoming an increasingly onerous task, that of believing all the things the world expected you to believe”). The day one has to rely on systems like Spindex is the day one admits one has lost control of the social net, which is surely no way to go for a supposedly life-enhancing experience.